US Olympic swimmer Michael Phelps proves that focus and attention can make or break you. Prior to attaining his 19th Olympic medal, breaking a record for the most medals ever won by an individual, that was held since 1964 by a now 77 year Olympiad, Larisa Latynina, Phelps had a thought. That thought cost him five hundredths (.05) of a second, changed history and he paid with Olympic Gold. I have no idea what that thought was, but it allowed him to glide rather than take a stroke, at the end of the 200 butterfly, which he hadn’t lost in at a major international competition in more than 12 years. He was mad as hell, but wasn’t through yet. From there, it was time for the medal ceremony, where the 20 year-old first-time Gold Medal winner Chad le Clos waited. It was fitting, in a way, that he was the one standing atop the podium. As a 12-year-old boy, le Clos had watched Phelps swim at the 2004 Games in Athens and decided he wanted to become a swimmer. Four years later, when Phelps out-touched Milorad Cavic by one-hundredth of a second to win gold in the 100 butterfly in Beijing, it was le Clos who looked on in awe and would later put seven copies of the swim on his computer in multiple languages. One man’s nightmare was another man’s dream. Phelps could sense how excited le Clos was. And as the two stood on the podium, a smile cracked on Phelps’ face. And as he and le Clos walked around the pool deck and posed for pictures, Phelps smiled more. He told the 20-year-old how to hold the gold medal when posing for pictures, and then he gave him directions on where to go after the medal parade. The younger Phelps never would have done that. He would have stewed over the bitter loss and carried it with him for weeks. But, with seemingly everything at stake, Phelps turned his emotions around with one warm-down swim. An hour after his disappointment in the 200 fly, Phelps was back on the pool deck again, anchoring his team in the 4×200 free relay. He told his fellow teammates — Ryan Lochte, Conor Dwyer and Ricky Berens — to get him a big lead. 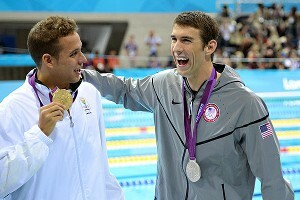 Chad le Clos, left, said after winning the 200 fly that Michael Phelps was his hero. They did just that. By the time Phelps came down the pool with 25 meters to go, the outcome was certain. And for the first time in his career, Phelps said he smiled in the middle of competition. “I knew we had done it,” he said. When he touched the wall, he spit a stream of water straight into the air. He knew. His teammates knew. Everyone knew. It was his 19th career Olympic medal. I’ve been studying the behaviors, strategies and tactics of elite performers for years. It all comes down to the subtle signals they attend to both in the environment and who they know themselves to be on a deeper level. How is it possible for Phelps to move through the roller coaster ride of his daunting experience, and stay focused, compassionate, and remain fiercely competitive? I think the Samurai have a word for it. Bushido. Allowing the violent existence of the samurai to be tempered by wisdom and serenity.